Cable management is a significant part of a network which is designed well. Managing cables have contributed to maintaining the essential function of data centers and protect devices from airflow blockages caused by unorganized and disordered cables. Therefore, users usually solve cabling problems with fiber patch panel, splicing fiber enclosure, server rack and other cable management methods. Among them, fiber optic patch panel is an economical, efficient and easy-to-use cable management solution for the modern data center. However, depending on different standards, there are different types of patch panels. Today, our topic is one kind of patch panels: the modular patch panel. The modular patch panel, or unloaded patch panel, is a kind blank fiber patch panel without pre-loaded built-in ports. But the modular patch panel has reserved holes. The empty slot allows users to install different ports according to his needs, such as CAT5E/CAT6 insertion module. Therefore, these panels can terminate different cables when different connectors are required to be installed. In addition, a modular patch panel can connect multiple types of cables. Generally, the modular patch panel is installed in the high-density 1U rack. It can be easily installed on the standard racks, cabinets or wall brackets. All empty ports are also numbered in advance to facilitate connection and identification. According to the style of design, the modular patch panel includes two types: flat modular patch panels and angled modular patch panels. I’ve once seen the jokingly stated that the difference between the flat panel and angled panel is the aesthetic difference. In fact, the most essential difference between the flat modular patch panel and angled modular patch panel is indeed the shape, the former is straight, and the latter has a “V” angle. Flat modular patch panels help horizontal cable managers organize and route cables to vertical managers. The angled patch panels facilitate cabling improvement. They are substitutes for management and do not require horizontal management of rack space. The angled patch panels increase the rack density and manage high-density applications in a quarter of the area required for conventional cable management systems. However, due to the requirement of front depth, the angled patch panels are not conducive to the installation of cabinets. The modular patch panel is useful for eliminating cable clutter, leaving enough room for airflow, and maximizing the performance and scalability of the data center. 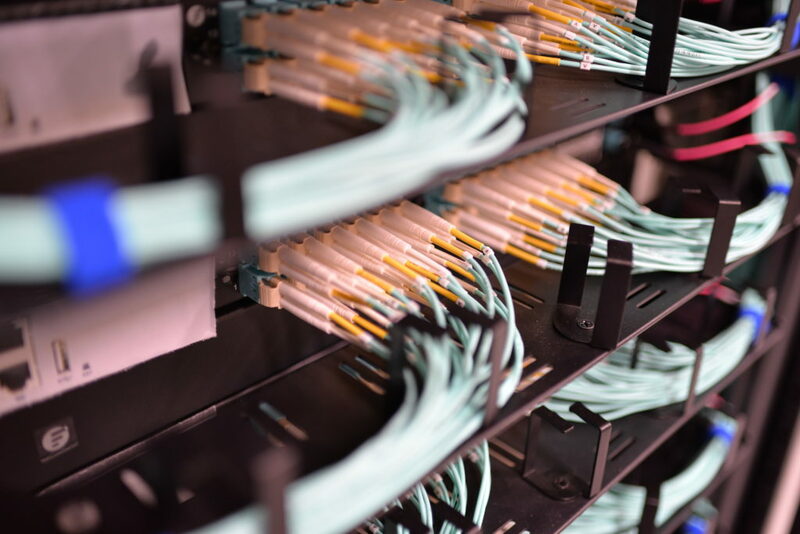 Today’s data centers need a reliable, scalable, and manageable cabling infrastructure, and then patch panel cable management solutions address these trends and promote high-density data center cabling efficiency. By the way, when buying patch panels, there is no single solution that meets all cable management needs. We hope you can get a little knowledge of patch panel cable management technology to successfully deploy cables in the data center. FS.COM can provide you with not only many kinds of fiber patch panels, but also fiber enclosures and server racks which support your cable managing work. This entry was posted in Cable Management and tagged Fiber enclosure, Fiber patch panel, modular patch panel, server rack on August 30, 2018 by Admin.